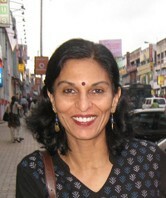 Smriti Srinivas is Professor in the Department of Anthropology at the University of California, Davis. Srinivas’ research focuses on cultures of the body, urban space, social and cultural memory, and religion. Her most recent book, In the Presence of Sai Baba (2008), examines a transnational religious movement centered on the Indian guru, Sathya Sai Baba (1926-2011) in three cities—Bangalore, Nairobi, and Atlanta—and the reworking of bhakti or devotion in a global milieu. This work presents insights for the understanding of “urban religion” as well as the relationship between a religious imaginary, understandings of the body, sites of sociality, and citizenship. Srinivas is co-founder of “Nagara,” a center for urban studies, history, and culture based in Bangalore. She is currently at work on a book on utopias that will include an article on travelling yoga cultures from Mysore to the US. More information is available at her institutional website here. (2008) In the Presence of Sai Baba: Body, City, and Memory in a Global Religious Movement. Worldwide hardback edition, Leiden/Boston: Brill; South Asian paperback edition, Hyderabad: Orient Longman. (2005) “Warrior goddess versus bipedal cow: Sport, space, performance and planning in an Indian city.” (With James Heitzman). In James Mills, ed.Subaltern Sports: Politics and Sport in South Asia. London: Anthem Press: 139-171. (2001) Landscapes of Urban Memory: The Sacred and the Civic in India’s High-Tech City. Minneapolis: University of Minnesota Press. (Revised Indian edition published by Orient Longman, 2004).